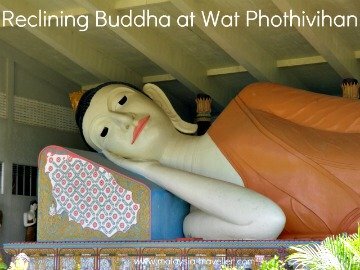 Wat Phothivihan was completed in 1979 and is famous for its Reclining Buddha statue. It is often mistakenly described as South East Asia's biggest reclining Buddha but that honour goes to the one at the Chauk Htet Gyi Pagoda in Yangon, Myanmar which is 66 meters long. 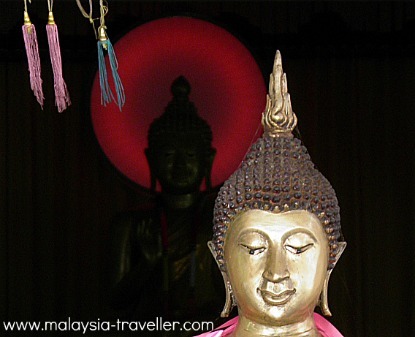 But it is Malaysia's biggest with a length of 40 meters, 7 meters longer than the next biggest contender, Wat Chaiya Mangakalaram in Penang. The craftsmanship of the statue is fairly simple when compared to similar but more elaborate reclining Buddhas in say Thailand or Myanmar. The statue is housed in a hanger surrounded by murals and smaller statues. 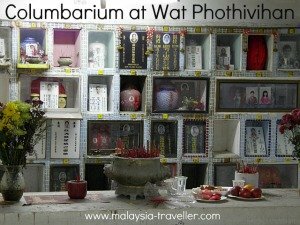 Underneath and to the rear of the Reclining Buddha is a columbarium (a vault with recesses to deposit urns containing the ashes of the departed). Many of these recesses contain photos of the deceased and offerings. One had a couple of cans of Guinness on display, presumably the gentleman's favourite tipple for refreshment in the next world. 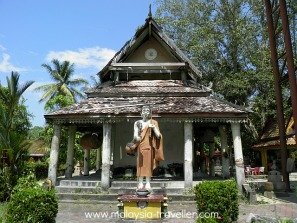 The grounds of the temple are attractive and contain various other statues and buildings. 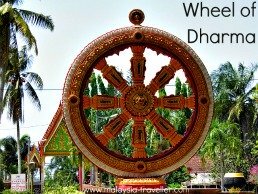 In front of reclining Buddha stands an intricate Wheel of Dharma which has deep symbolic significance in Buddhism. 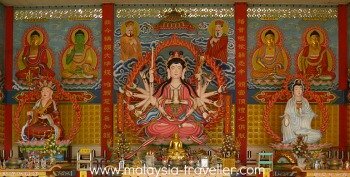 There is a Chinese Pavilion and a Tibetan style hall featuring a statue of the Bodhisattva Avalokitesvara with 18 arms. The compound also includes accommodation for monks and visitors. I tried lunch in the restaurant which I thought would have been vegetarian only but it was not. I am not sure what you call this rice-based dish but it was quite tasty (and spicy!). 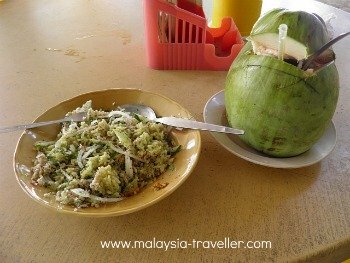 It is about 15km west of Kota Bharu. Take route 134 to Chabang Empat then turn left on route D23 for a further 5km. The temple is between Kampung Ana and Kampung Berok.